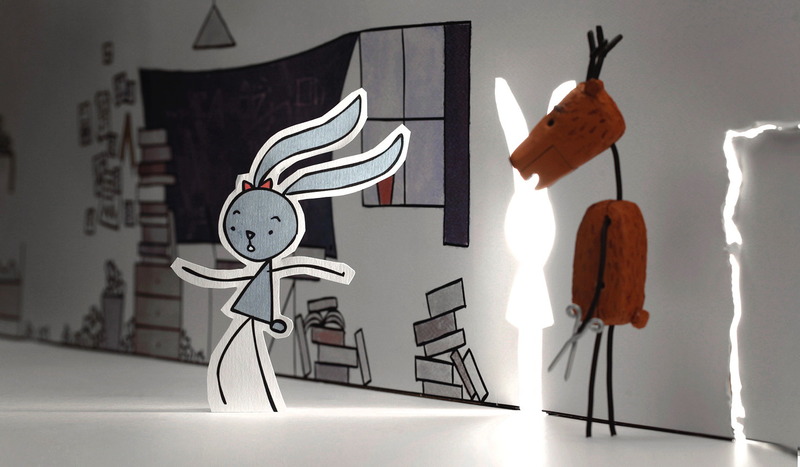 Before Hungarian filmmaker Péter Vácz successfully brought James’ personal tale of loss and regret to impressive stop motion life in the All I’m Saying music video, he wowed festival audiences across the global – along with audiences at DN’s own Camp Bestival screenings – with his charming tale of obsession and enduring friendship, Rabbit and Deer. It’s been a long wait, but finally Péter has brought his brilliant mix of hand drawn and 3D animation to the online audience this week and so we thought it apt to revisit some of the key topics we discussed with Péter in last year’s podcast interview and show how this talented director mastered new techniques and a tight timeframe to create a film friendship which truly holds universal appeal. 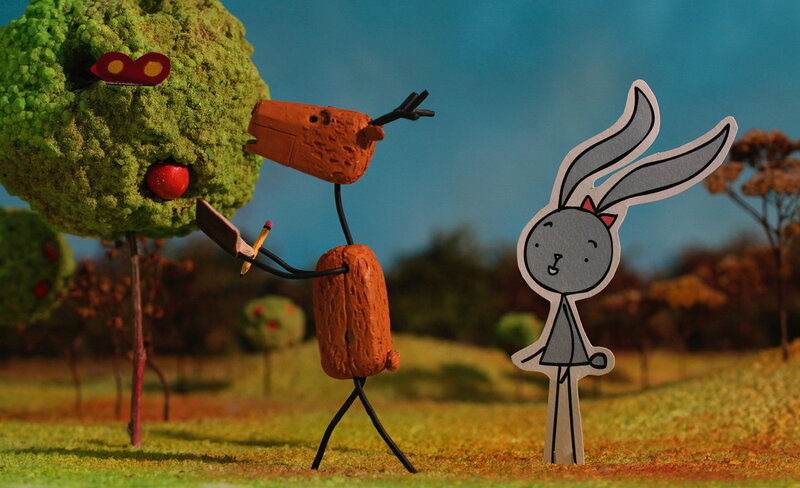 Unlike other mixed media films where sometimes the style can feel somewhat arbitrary, Rabbit and Deer’s style is completely dictated by the action within the story. Was that narrative drive of styles present from the beginning? Yes. When I started I wrote down three things which were: mixing techniques, working on a narrative story and using personal subjects. So with the first one ‘mixing techniques’ it was kind of an inspiration source or a way of working for me to find new ways of telling stories. Then I came to the two characters which were inspired by my previous relationship – the Rabbit and the Deer and the Deer was me. Then slowly as I started to put together the elements of the film, the story, it just found its way to the 2D and the 3D, and the two characters and how this difference describes their relationship. You’ve said that the story sprang from a game you invented? Oh yeah. I don’t know if you’ve done this, but I think many people do it as well, imagining what kind of animal you look like. You start realising that she looks like a rabbit or she has these characteristics and then you’re just stuck with these alter egos or avatars. That was kind of the game, it just gave us another way of communicating with each other. I made these illustrations and that’s how these two characters started to develop their own unique characteristics which I started to work with on the film. As your MA graduation film, how much back and forth was there with your tutors in regards to the structure, shape and style of the film? Well I didn’t have any trouble communicating with my tutors whilst making the film. I think they really helped me a lot, because it wasn’t a whole planned out idea in my head when I started so until the end of the production I was developing the whole film – the scenes, finding out the whole storyline so it was a really nice and continuous development. Animation is associated with lots of meticulous planning beforehand. Given that you were mixing these styles and had to match up elements across the various dimensions, how arduous was that preproduction process? That’s a hard one to answer. I started to write the story, meanwhile I started to draw the storyboard. Then from the storyboard I stated to make the animatic and while I was making the animatic knowing that it would be a mixed technique I was always preparing myself and trying to find out the best and easiest way to join these two techniques. Many ideas came while making the film. You know when you have the paper in your hand and you start to think how to use it as a background, should I print out every background paper or should I composite? These solutions came as the film went along. I think my biggest enemy was time! Had you previously worked with all the techniques you use in Rabbit and Deer or was there a certain amount of live experimentation taking place during production? I think what I really love about stop motion is that I’m kind of forced to come up with new ideas, I’m forced to solve problems which just jump out of nowhere. Making the Deer puppet I used this 3D prototyping for the replacement mouths where you model the shape in 3D and then have this printer which prints out the objects. That was really new to me and I really had to plan out to have these model files in time, to send them to the printing place, to take them to paint. I had to plan really well to make the film. Máté Hámori composed the score for Rabbit and Deer. What were the references you discussed when conveying the mood you wanted for the film? Well at the beginning when I made the animatic – this has kind of become my usual way of working – I try to collect songs which best describe different parts of the film so I had this well built up mood. I had this music and I’m really fond of René Aubry, this French guitarist, musician, composer – he actually made the original score for The Gruffalo. I put some music from him into the animatic and at some point I was like “Who should I ask to make the score for my film?” and I thought, “Why shouldn’t I just ask René Aubry, who knows maybe I can reach him and maybe he would be interested?” So I tried for a while to reach him but it was just hard and I couldn’t get in contact with him personally. So when the graduation happened I used all these sample songs in the film and then I found Máté who is also a guitarist and has this enthusiasm to compose music – he’s not actually a professional composer. We sat down and I said OK let’s give it a try. I wanted to have René Aubry’s style – the instruments he uses, I wanted to adopt the playfulness from his style, from his way of expressing himself through music, and slowly I think we reached it. I’ve listened to the soundtrack without the film and I feel that it’s a complete whole thing. I listen to it and it has a character and without pictures it describes the different parts of the film so I’m really happy with it. I think I succeeded in making a film which all ages can find something interesting in. I’ve watched Rabbit and Deer with different audiences and it’s clear the film appeals across a variety of ages. When you first conceived the story did you have a particular age group in mind? I can imagine that most filmmakers aim to make something which everyone will like, but I don’t know, I didn’t really plan it for kids, I didn’t only plan this film for adults. I thought I will make this film as my feeling comes. It was kind of a problematic part because while I was talking with my tutors they were asking me to specify my target. I was like OK, since it came from a relationship at the beginning I was thinking should I write a story which describes more a relationship or more a friendship? There were discussions about if it’s a friendship it’s more understandable, there are more parts that children can be attached to. So I think in the end it just became a mix. I tried to focus on it being a friendship but there are elements obviously which the adults can relate to and then there are these elements from my personal style. I think I didn’t really stress myself to try to find a target and make a film for them. I think I succeeded in making a film which all ages can find something interesting in. Listen to our full Rabbit and Deer interview with Péter Vácz.